This pattern was updated on March 6, 2018. If you saved this or printed this pattern before the above date, you may want to reprint or resave with the corrections. Great! Thanlks for posting this – I’ve been wanting to try this technique and I think this will make a super project. Thanks again. Wow, that’s super CUTE! Thanks for this pattern. I too think it will be a great intro to this colorwork technique. Can’t wait to give it a go! I love that small purse and the colors are beautiful. I might even try it if I can find the right colors. That’s an awesome pattern. Thanks so much for sharing. I love the pattern and design! I can’t wait to start it. I looked through my cotton stash and have two OLDER skeins of Rowan Denim Blue, but the gauge is 5st=1″. Do I need to get a lighter wt. denim? Since I haven’t bought this cotton yarn in ages, i wasn’t sure if it comes in the thinner gauge. I can always check! thanks so much. loved your blog. I just joined and I can’t wait to try the purse. I’m a grandma and I’m making it for my teenage granddaughter. It looks like something she would love. I might make one for me too. I love this pattern. I’ve never made anything with a pattern so can’t wait to try it. I think I’m going to make it with worsted weight cotton so it’s a bit larger…..now to hunt up the colors. Am new to this blog..I enjoyed reading this article great info here.. I saw this on pinterest again, and it is just so darn cute. I have never put the lining in mine, and I really really really need to do that! Never mind.. Just found it. Can’t wait, to try it. Denise, where did you find pattern? Cute and effiicient explanations tanks à lot! Would love to make this purse! 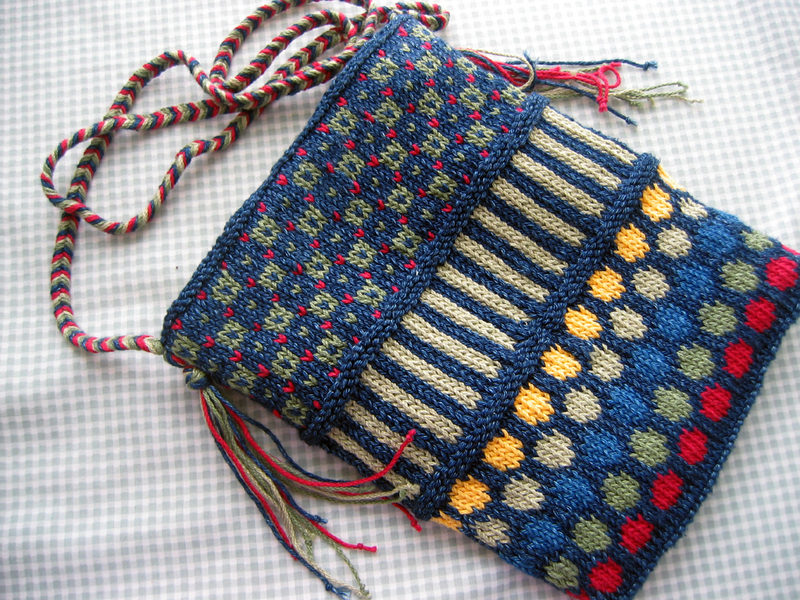 It is so beautiful and very clever design….Please tell me how to get the pattern! You can also find it on this Dots and Strips page (under the My Designs tab) near the bottom where it has the words ” Dots and Stripes purse and lining instructions ” in blue. I hope you enjoy knitting and please send me a picture of it when you’re finished.